Operation Market Garden, a most ambitious invasion and an immense, daring offensive to defeat Nazi Germany before the end of 1944. The Germans, however, proved much stronger than the Allies anticipated. Spain: Day 322 of 985 of the Spanish Civil War. Spain: Day 687 of 985 of the Spanish Civil War. CBI - China: Day 332 of 2,987 of the 2nd Sino-Japanese War. Day 117 of 124 of the Battle of Henan. USA: Winston Churchill is quoted in Collier's magazine: "Unless some change of heart or change of regime takes place in Germany she will deem it in her interest to make war, and this is more likely to happen in the present year than later on." 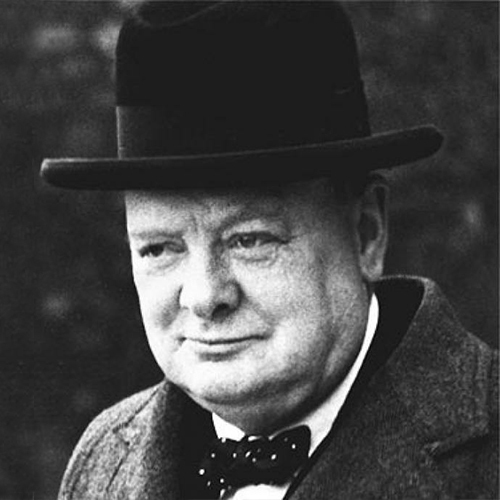 Orator, statesman and British Prime Minister Winston Churchill campaigned tirelessly to win American support for the war against Hitler and the Axis powers. 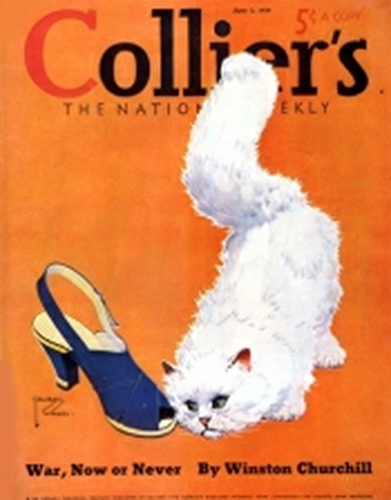 Collier's, an American magazine founded in 1888, reached a readership of 2.5 million during World War II. In the October 14, 1944, issue, the magazine published one of the first articles about concentration camps, Jan Karski's "Polish Death Camp," a harrowing account of Belzec. The magazine ceased publication in 1957 and was revived in February 2012. CBI - China: Day 697 of 2,987 of the 2nd Sino-Japanese War. CBI - Mongolia: Day 24 of 129 of the Battle of Khalkhin Gol, a border dispute between the Soviet Union and Japan. UK: All aliens living in the UK are forbidden to leave home between 10:30 pm and 6:00 am. Churchill orders the formation of commando forces for raiding inside occupied Europe. Atlantic: German sub U-37 sinks the Finnish ship SNABB 300 miles west of Cape Finisterre, Spain. ETO - Norway: Day 56 of 63 of the Battle of Norway. During the night, British destroyers and Norwegian fishing boats ferry Allied personnel to six troop transports in various nearby fjords. ETO - France: Day 25 of 44 of the Battle of France. Day 8 of 9 of Britain's Operation DYNAMO, the evacuation of Dunkirk. Another 26,746 troops are evacuated for the day; 312,081 since the operation began on May 27. The remaining French and Belgian troops elect to stay and fight. Soviet Union: Soviet troops begin preparation for their upcoming invasion of the Baltic States of Latvia, Estonia, and Lithuania. CBI - China: Day 1,063 of 2,987 of the 2nd Sino-Japanese War. Day 202 of 381 of the Battle of South Guangxi. Day 34 of 49 of the Battle of Yichang. UK: The Attlee memorandum is approved by 2,430,000 to 19,000 at a Labor Party conference. "A necessary prelude to a just peace is a total victory." Atlantic: British cruisers HMS AURORA and HMS KENYA attack the German tanker BELCHEN 80 miles southwest of Greenland while it refuels German sub U-93. U-93 manages to escape, but the BELCHEN is severely damaged and is scuttled by her crew. Atlantic: German subs U-48 and U-75 attack an Allied convoy 950 miles west of Brest, France, sinking Dutch ship EIBERGEN and British tanker INVERSUIR. Atlantic: British passenger liner MAMARI, modified to look like the carrier HMS HERMES, is attacked by the Luftwaffe off Cromer, Norfolk, England. She gets stuck on the wreckage of tanker AHAMO. After sundown, German E-boats come over and sink her. ETO - UK: Before dawn, the Luftwaffe bombs Hull and Tweedmouth in England. During the return trip, one of the bombers shoots down a British plane. Turns out this plane was nothing more than a group of five civilians out joy-riding over the Channel. MTO - Libya: Day 55 of 256 of the Siege of Tobruk. East Africa: Day 359 of 537 of Italy's East African campaign in the lands south of Egypt. CBI - China: Day 1,428 of 2,987 of the 2nd Sino-Japanese War. Atlantic: Day 141 of 169 of Germany's Second "Happy Time," during which U-boats sink 609 Allied ships with little risk. U-502 sinks US freighter M F ELLIOTT off the Florida Keys. Russian Front - North: Day 269 of 872 of the Siege of Leningrad. Russian Front - North: Day 30 of 658 of the Siege of the Kholm Pocket. Russian Front - Center: Day 6 of 31 of Operation KREMLIN, a German diversion to trick the Soviets into thinking Moscow is their main objective instead of Stalingrad and the Caucasus. Russian Front - South: Day 217 of 248 of the Siege of Sevastopol, Crimean Peninsula. The heavy bombardment continues. MTO - Libya: Day 9 of 27 of the Battle of Gazala. Rommel sends the French General at Bir Hakeim a hand-written note urging him to surrender. East Africa: Day 30 of 186 of the Battle of Madagascar. CBI - Burma: US 10th Air Force B-25s bomb a target at Lashio. CBI - China: Day 1,793 of 2,987 of the 2nd Sino-Japanese War. Day 20 of 124 of Japan's Zhejiang-Jiangxi Campaign, launched to punish anyone suspected of aiding the Doolittle raiders in China. Roughly 250,000 Chinese will be killed. PTO - Alaska: Japanese planes from the carriers RYUJO and JUNYO attack targets at Fort Mears and Dutch Harbor. US 11th Air Force scrambles to intercept the Japanese airplanes but they get there too late. In response, the US Navy sends 5 cruisers and 4 destroyers to the Aleutian Islands. PTO - Australia: Day 4 of 9 of the Battle at Sydney Harbor. PTO - Malaya: Day 105 of 357 of the Battle of Timor Island. PTO - Midway: Japanese submarines arrive to look for US warships coming from Hawaii toward Midway, but they don't know the US carriers have already passed this point. US 7th Air Force B-17s, flying out of Midway Island, attack 5 large warships 570 miles off Midway, claiming 5 hits but no sinkings. PTO - New Guinea: US 5th Air Force B-17s hit the wharf, warehouse area and military camp at Rabaul. USA: Day 4 of 9 of the Los Angeles Zoot Suit Riots. Eleven sailors get into a brawl with a group of zoot suit clad Pachucos. The fighting begins to spread. 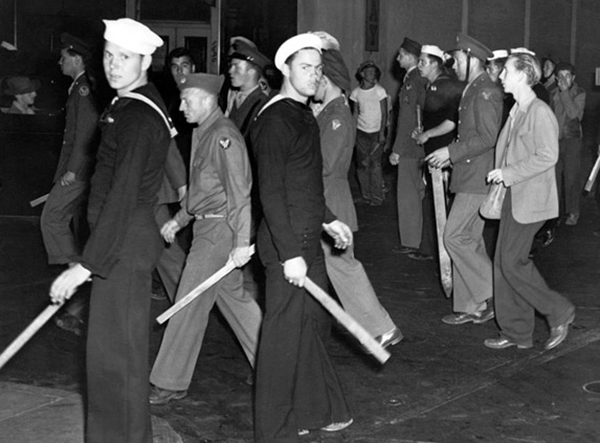 About eleven sailors got off a bus and started walking along Main Street in Downtown Los Angeles. At some point they ran into a group of young Mexicans dressed in zoot suits and got in a verbal argument which turned into a brawl. The Los Angeles Police Department responded to the incident, arriving at the scene seeking to clean up Main Street from what they viewed as "the loathsome influence of pachuco gangs." The sailors claim that they were jumped and beaten by this gang of zoot suiters. ETO - UK: The first fruits of victory reach British shops in the form of Algerian wine. ETO: French Resistance saboteurs destroy 300 tons of tires in the Michelin factory at Clermont-Ferrant. Germany: German troops discover 150 Jews hiding in a bunker in the Warsaw ghetto in Poland. They destroy the bunker and kill all the people within. Russian Front - North: Day 634 of 872 of the Siege of Leningrad. Russian Front - North: Day 395 of 658 of the Siege of the Kholm Pocket. Russian Front - Center: Operation COTTBUS: German troops attack local partisans in Barysaw (Borisov), Byelorussia. MTO - Italy: Day 13 of 20 of the naval and aerial bombardment of Pantelleria Island. US 12th Air Force light and medium bombers attack the defended positions on the island. CBI - China: Day 2,158 of 2,987 of the 2nd Sino-Japanese War. Day 23 of 23 of the Battle of West Hubei. Technically, the battle ends in a stalemate, but the Japanese will soon withdraw from the area. PTO: Day 8 of 47 adrift in a raft for the survivors of B-24 GREEN HORNET that crashed 850 miles from Hawaii. PTO - Alaska: Day 362 of 435 of the Battle of Kiska, Aleutian Islands. All Japanese resistance on Attu Island comes to an end. US 11th Air Force attacks the enemy on Kiska Island. PTO - New Guinea: Day 43 of 148 of the 2nd Battle of Lae-Salamaua. US 5th and 13th Air Forces provide air support. USA: Engineers at Curtiss-Wright publish notes concerning defects found in the current generation of SB2C Helldiver carrier-based dive-bombers, but the company doesn't tell the US Navy. Many aviators will be killed or injured due to this defect. ETO - France: The RAF bombs in the Pas-de-Calais and Cherbourg areas. Russian Front - North: Day 123 of 191 of the Battle of the Narva Isthmus, Estonia. Both German and Soviet troops remain locked in their defensive positions. Russian Front - South: Day 57 of 60 of the Battle of Romania, 1st Jassy Offensive. MTO - Yugoslavia: US 15th Air Force B-24s bomb the waterfront and port area of Omis and in the western part of Split. MTO - Italy: Day 134 of 136 of the Battle of Anzio. RAF and US Air Forces provide air support. Hitler authorizes his troops to evacuate Rome. CBI - Burma: Day 91 of 166 of the UK's Operation THURSDAY. Monsoon season bogs down all operations. CBI - Burma: Day 86 of 147 of the Battle of Myitkyina. US 10th Air Force provides air support. Monsoon season bogs down all operations. CBI - Burma: Day 64 of 302 of the Chinese Salween Offensive. US 14th Air Force provides air support. Monsoon season bogs down all operations. CBI - China: Day 2,524 of 2,987 of the 2nd Sino-Japanese War. Day 48 of 259 of Japan's Operation ICHI-GO. CBI - India: Day 88 of 118 of the Battle of Imphal-Kohima. PTO - Caroline Islands: US 7th Air Force bombs targets in the Truk Atoll. PTO - Dutch East Indies: The USS CABRILLA sinks a Japanese coastal patrol boat off Borneo. PTO - New Guinea: Day 8 of 83 of the Battle of Biak. 5th Air Force provides air support. PTO - New Guinea: Day 172 of 597 of the Battle of New Britain. US 13th Air Force provides air support. PTO - New Guinea: Day 43 of 481 of the Battle of Western New Guinea. 5th Air Force provides air support. PTO - Solomon Islands: Day 216 of 295 of the Battle of the Bougainville Islands. US 13th Air Force provides air support. Middle East: French troops reluctantly leave Damascus, French Mandate of Syria and Lebanon, leaving the British in control. CBI - China: Day 2,889 of 2,987 of the 2nd Sino-Japanese War. Day 64 of 91 of the Battle of Zhijiang. US 14th Air Force provides air support. Japanese troops continue pulling out of China. Day 56 of 60 of the Battle of West Hunan (near Zhijiang). Japanese troops continue withdrawing from southern China. PTO: The USS SEGUNDO sinks a Japanese ship with her deck gun. PTO - Alaska: US 11th Air Force: On Shimushu Island in the Kurile Islands, B-24s bomb scattered targets in the naval base area while B-25s conduct a low-level bombing of the Masugawa River Cannery. PTO - Dutch East Indies: Day 34 of 52 of the Battle of Tarakan Island. PTO - Japan: Fighters from USS TICONDEROGA hit the airfields on Kyushu in an attempt destroy the kamikazes on the ground. However, about 50 kamikazes make the 9th of such raids on US ships. 7 Japanese ships are sunk or damaged by naval mines laid in Japanese waters. PTO - Japan: US 20th Air Force attacks targets on Amami Oshima Island. PTO - Japan: Day 64 of 83 of the Battle of Okinawa. US Marines land on Iheya Jima in the Ryukyu Islands. PTO - New Guinea: Day 524 of 597 of the Battle of New Britain. US 10th Air Force provides air support. PTO - New Guinea: Day 408 of 481 of the Battle of Western New Guinea. US 10th Air Force provides air support. PTO - Philippines: Day 226 of 299 of the 2nd Battle of the Philippines, aka the Liberation of the Philippines or the Philippines Campaign. PTO - Philippines: Day 171 of 244 of the Battle of Luzon. 5th Air Force provides air support. PTO - Philippines: Day 86 of 159 of the Battle of Mindanao Island. 5th Air Force provides air support. PTO - Philippines: Day 78 of 135 of the Battle of the Visayas region. US 5th and 7th Air Forces provide air support. Newfoundland: The first of two referendums is held to determine Newfoundland's future as to be an independent dominion, remain a British colony, or to become a part of Canada. The eventual decision by Newfoundlanders will be to enter the Canadian Confederation, which will become official on 31 Mar 49. Music, fashion, race relations, neighborhood activism and a World War all come together and erupt in violence in Los Angeles. 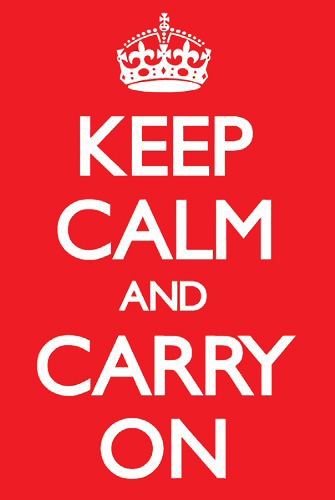 The iconic British motivational poster that took 60 years to become so.